Due to popular demand I am pleased to address the topic of the Trolls. When some people hear the word troll they think of rude people who make inflammatory comments on the Internet, or ugly dolls with colorful hair. Both of these conjure up negative images. I would like to tell you about the good kind of Trolls. During my Senior year in High School I had an English class that was held outside of the main building in a trailer. (No, it was not resource, it was A.P.) One day as we came to class we noticed that there was some construction work done outside of the trailer to bury some electrical work. They dug up a patch that was several feet wide and covered it up with tar when they were done. It did not match the surrounding concrete so it kind of stuck out. One day after class a friend and I were leaving the trailer and he intentionally stepped way beyond the tar and jokingly said "there is no way I am going to walk on that evil pit". This simple action planted the seed for what was to become the Trolls. For the next several weeks until school was out several of us in that class always stepped over the pit so nothing bad would happen to us. During summer vacation we were bored one night and were talking about the pit to a younger brother. He thought it sounded funny so we decided to test it out on him. We took him by force from his house and went down to the pit. We told him once you sit on it you will become a troll. When he actually saw it, he broke free and ran about 150 yards away until we finally caught him. I was surprised he would do this since he was only wearing his boxers. Anyway we forced our first recruit to sit on the Troll Pit and said "Boo" 7 times which became the official way to make someone a Troll. We also went through this procedure ourselves in order to make things official. We continued the pattern of taking friends by force and sitting them on the pit. We initiated between one to three each week and it got easier each time because we had more help from the additional recruits. We were close friends so we could usually sneak into their rooms or lure them outside and throw a blanket over them and take them to the pit. Most of the kidnappings were not too hard although 3 or 4 were legendary in the struggle they put up. I felt kind of bad when we scared people, but I figured if the Seminary council can kidnap people then it was OK.
After a while we had many Trolls so I had to utilize my organizational skills. 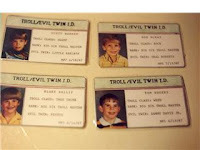 Each Troll was given an number, categorized by Class and Rank, and assigned an Evil Twin. I made ID cards for each member which required a second grade picture of each participant. (See attached picture). We had the Big 6 Troll Masters (The founders), then there were the Dirty Dozen which were followed by the Bakers Dozen. There were classes of trolls too: Weed, Desert, Bridge, Mountain, Tree Trunk, and Rock Trolls. The Evil Twins we assigned were not always completely accurate. I am a good example of this since mine was Sammy Davis Jr. Some of the other evil twins were: Ivan Drago, Jaws from James Bond, Gary Coleman, Heat miser, Nicholas Bradford, Ralph Mouth, Festus from Gun Smoke, Buster Crab, Dr. Who, Gilligan, and Oliver North. We had regular meeting (parties) and we tried to keep it from turning into the Mafia or secret combinations by following our creed which was printed on the back of each card. "Trolls must remember to be nice and to stay cute and cool". The Trolls continued to grow strong and prosper up until I went on my mission. I got updates of new recruits for the first several months I was gone, but without the dedicated leadership, they soon fell into apostasy and gradually the organization fell apart. My only regret was that I did not have more time to involve more friends while it was in it's prime. Some people might think the Trolls organization was just a cute High School club and is all in the past. They are wrong. Our cards are still active and I need only summon them with a text message or e-mail and I would have 6 weed trolls ready to jump into action. (Just like the Bourne Identity agents). This year marks the 20th anniversary of the Trolls and there will soon be a new and improved Troll movement coming in the future. If you would like to be a part of history let me know.